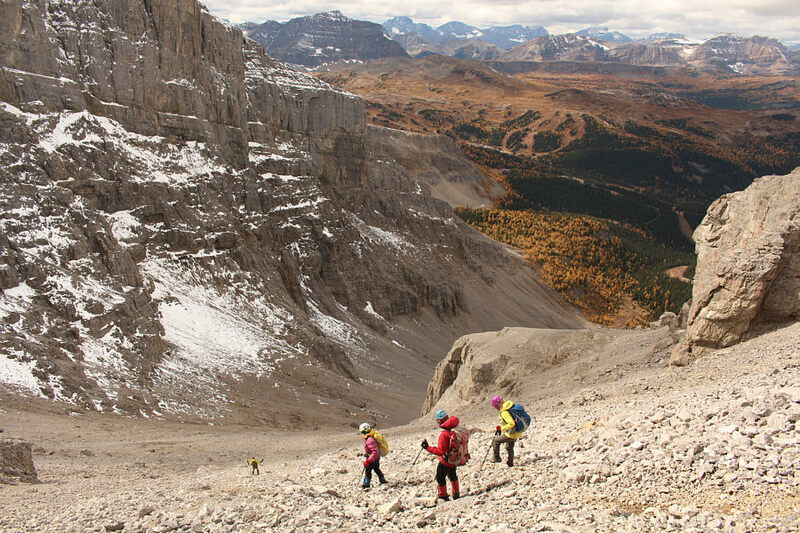 On 30 September 2017, I accompanied Anna Kowalska, Jim MacDonald, Marta Wojnarowska and Zosia Zgolak for an ascent of Mount Howard Douglas near Sunshine Village in Alberta's Banff National Park. 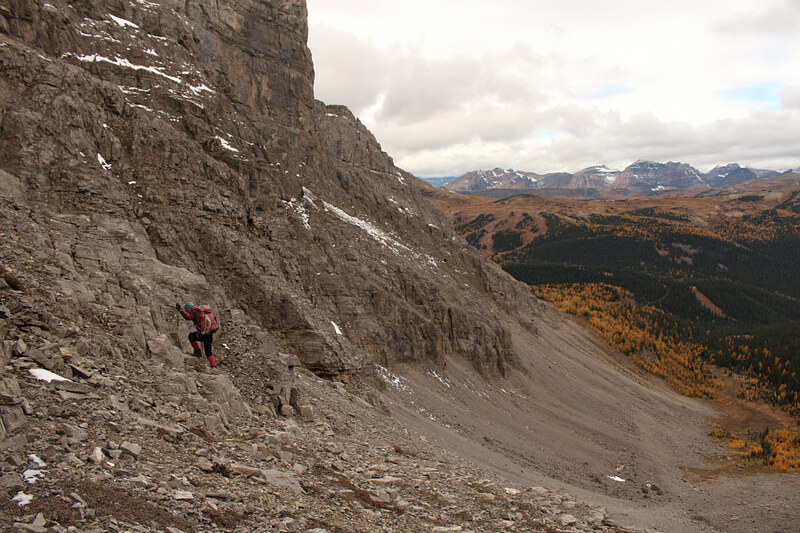 The scramble route is described in Andrew Nugara's More Scrambles in the Canadian Rockies. 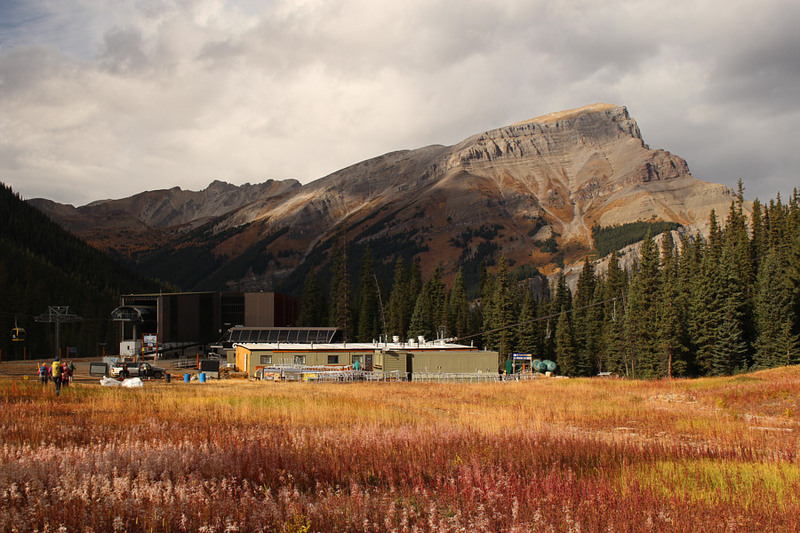 From the lower gondola station, we hiked up the Sunshine Village access road until we reached the base of Goat's Eye Mountain chairlift. 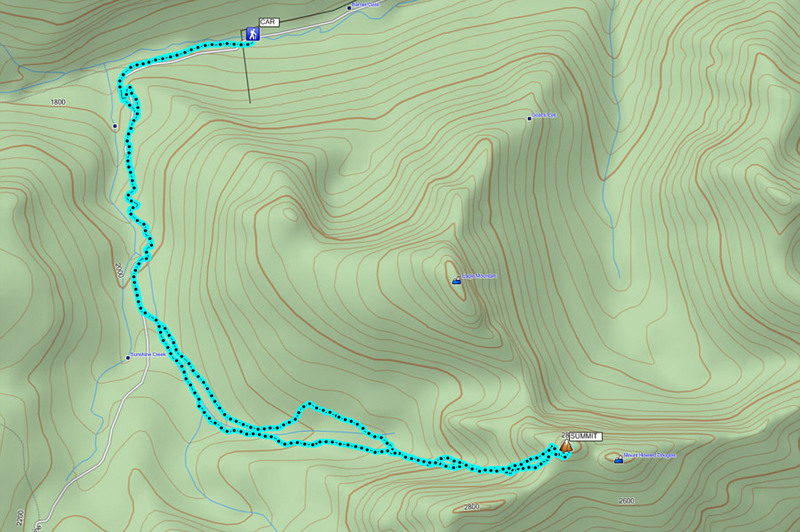 We left the main road here and followed another road which climbs up the lower slopes of Eagle Mountain. 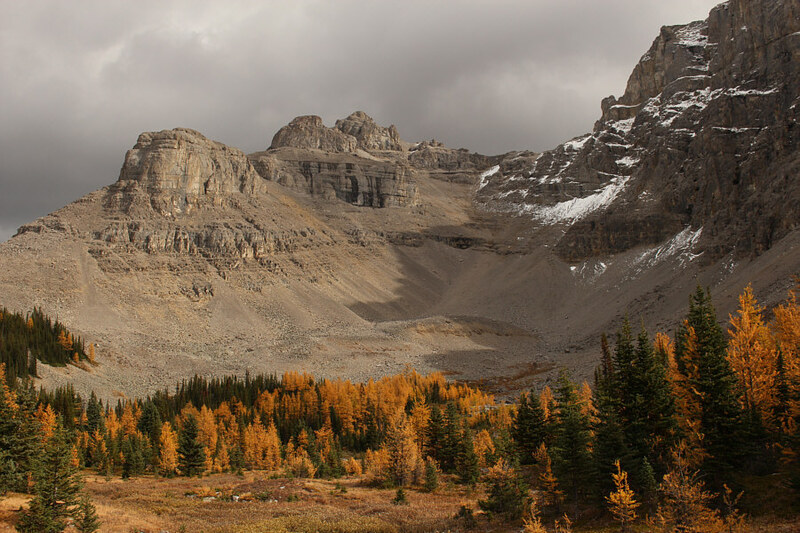 Instead of continuing along the road up Eagle Mountain, we subsequently headed into the trees to the south and bushwhacked a bit before reaching the basin west of Mount Howard Douglas. The rubble in this basin is miserably loose, and we tried our best to stick close to the steeper but more solid cliff bands to climber's right. 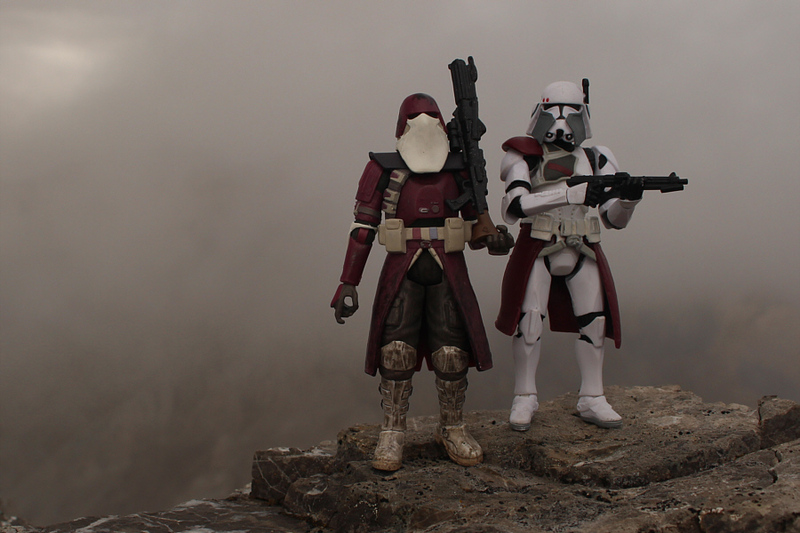 Even here, the rocks are horribly unreliable, and we had to be doubly careful about wherever we stepped or whatever holds we grabbed. 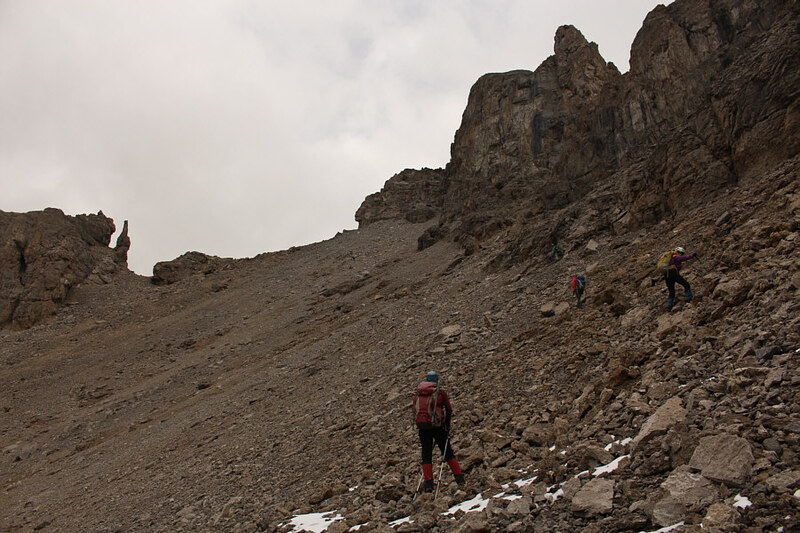 As we approached the scree ledge traverse described by Nugara, Marta led everyone else up a short cut through some cliffs while I stuck to treadmill rubble and circumvented the same cliffs to climber's left. 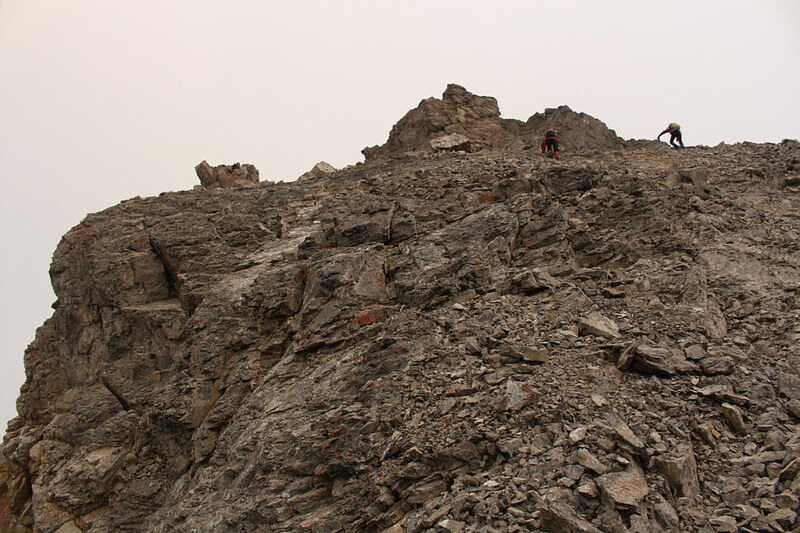 We reunited above the cliffs on Nugara's scree ledge, and from there, we groveled up more loose rubble to reach the south side of the summit block. 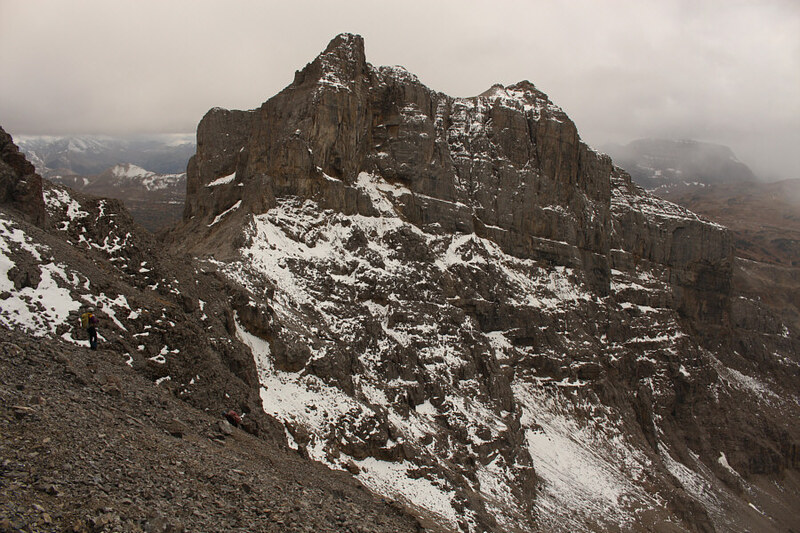 We finished the ascent by climbing up a short but tricky rock step just before the summit. 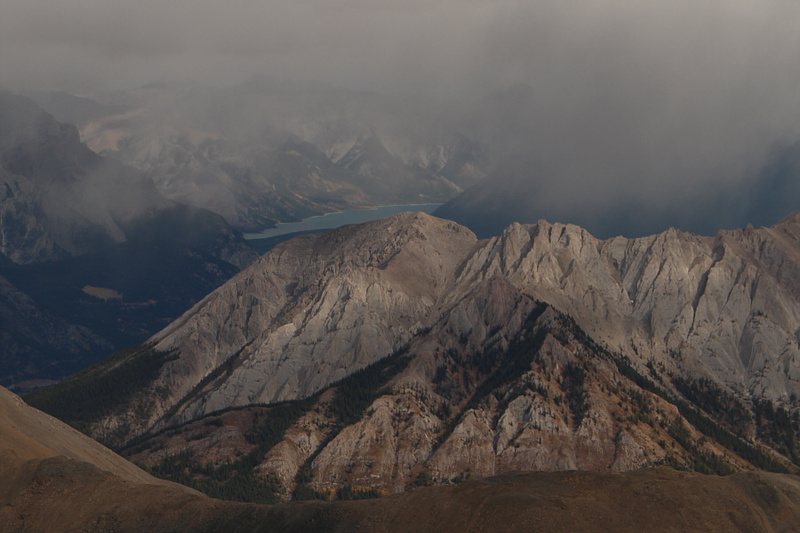 A snow squall greeted us when we reached the summit, and with no views to speak of, we had no reason to linger. Just as we were about to leave though, the clouds suddenly cleared up, and we stuck around a bit longer to enjoy some far-reaching views. 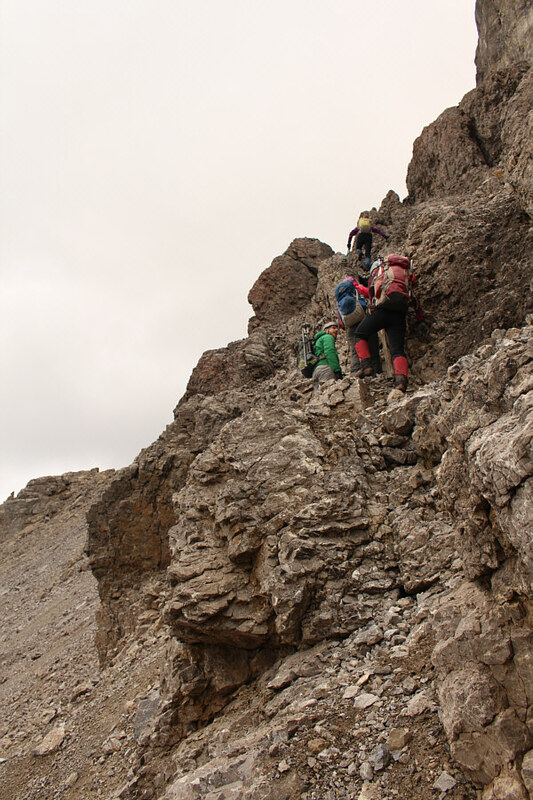 On descent, we retraced our steps back down to the scree ledge taking extra care not to knock rocks down on each other. 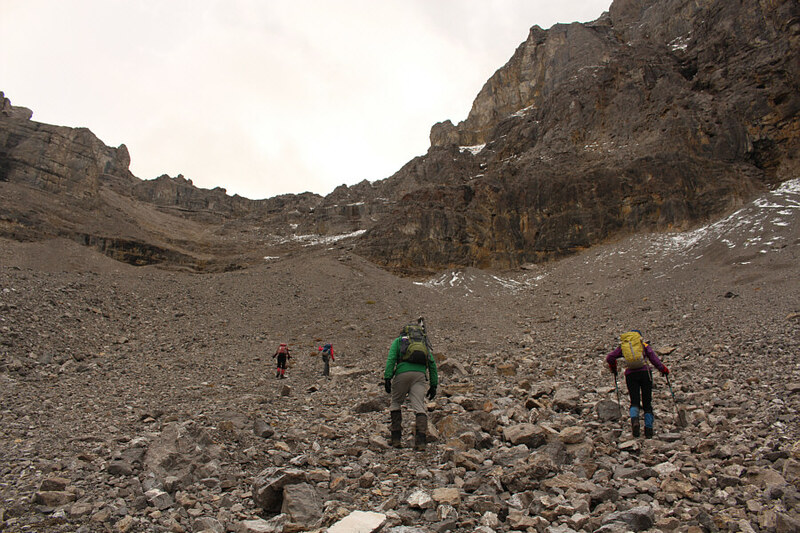 Everyone traversed back to where I had initially gained the scree ledge, and from there, we took advantage of the loose rubble to quickly surf down to the bottom of the basin. Back on easier ground, we took a short break before hiking out along the basin's drainage. This eventually led us without too much trouble back to the base of Goat's Eye Mountain chairlift, and we finished the trip with an easy walk down the access road. 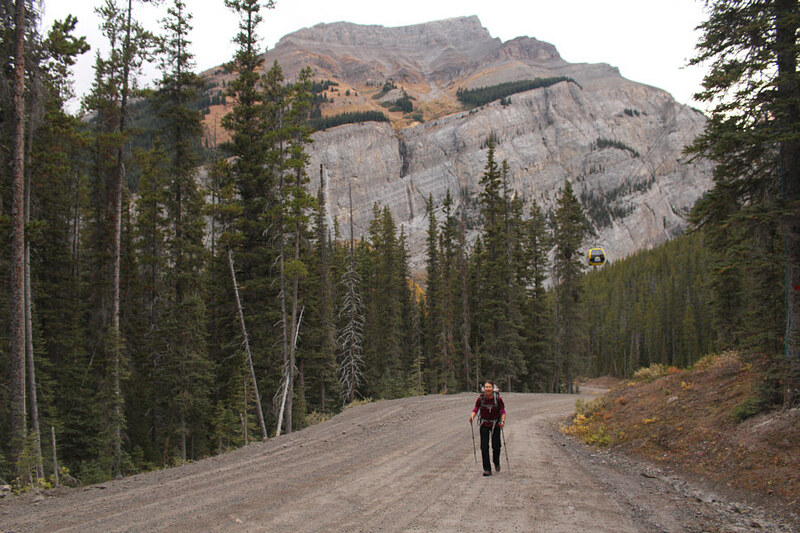 Zosia hikes up the Sunshine Village access road with Mount Bourgeau behind her. 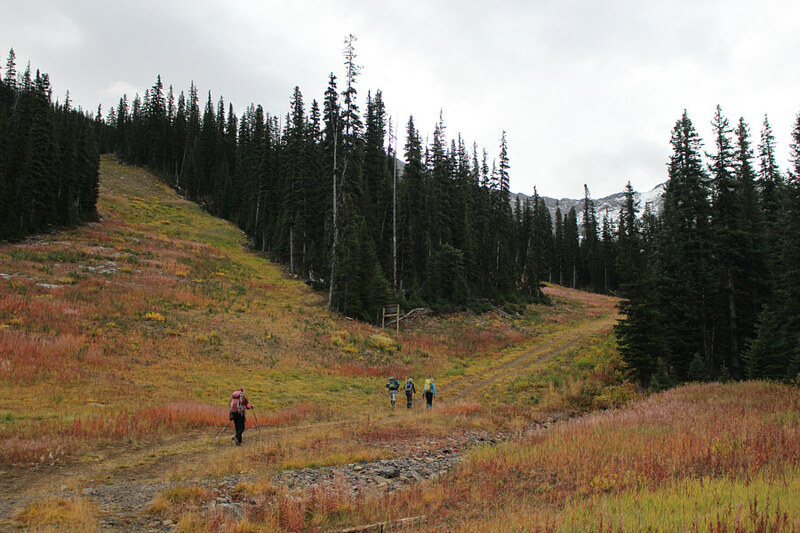 Just past the base of Goat's Eye chairlift, the group heads up a rougher road which is the Sunshine Coast ski run in winter. 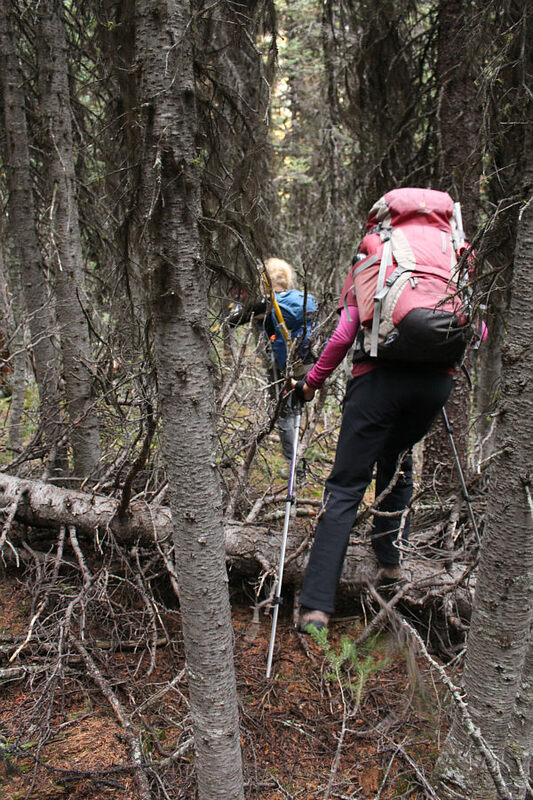 Anna and Zosia endure some light bushwhacking as they make their way toward the basin below Mount Howard Douglas. 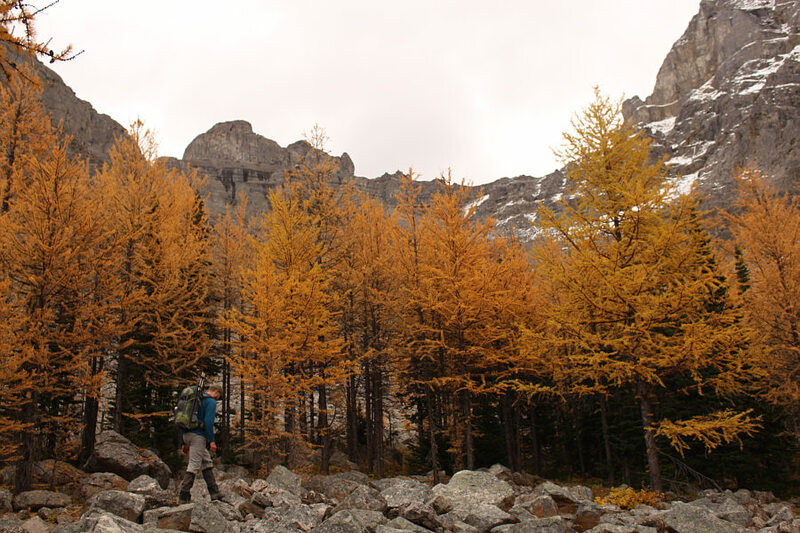 Jim picks his way across some boulders in a glade surrounded by larches. 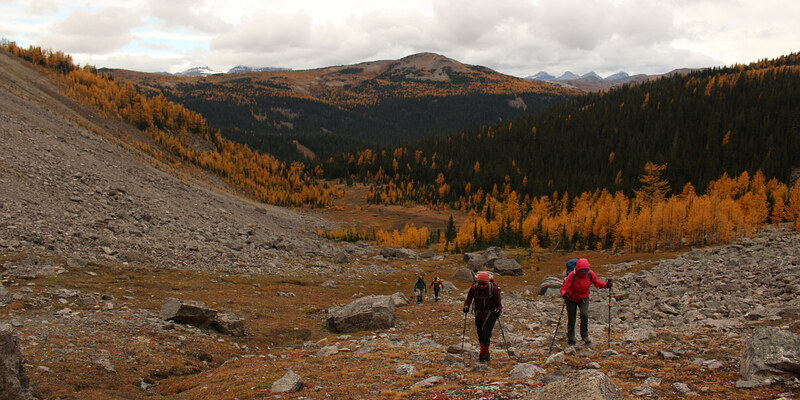 The group enters the basin west of Mount Howard Douglas. 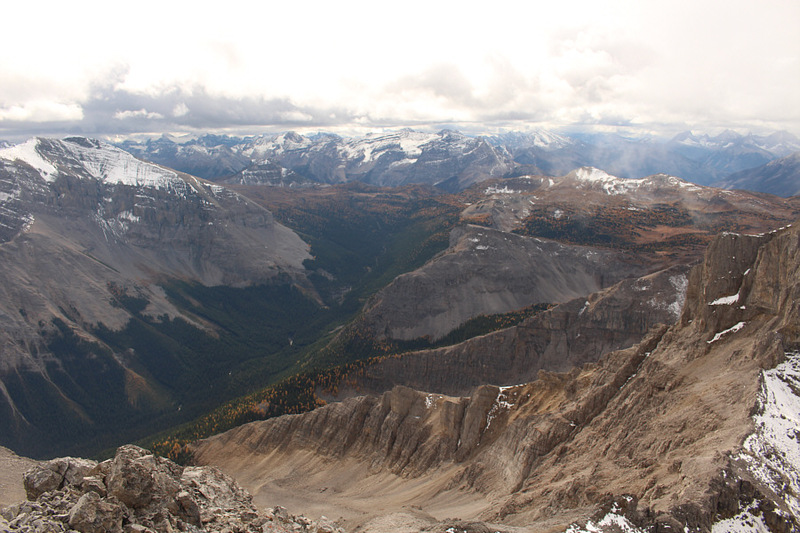 At centre in the distance is Wawa Ridge. The group grinds its way up lots of loose rubble in the basin. Zosia takes to some cliff bands which offer more solid footing. 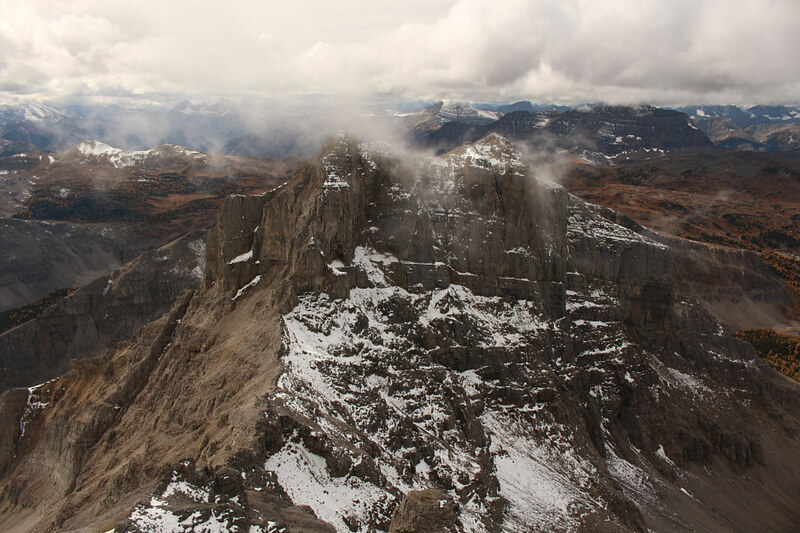 The scree ledge (hidden) described by Nugara is best accessed near the base of the big cliffs just right of centre. Marta leads Jim, Anna and Zosia up a short cut through the cliffs below the scree ledge. Marta (far left) waits for the rest of the group to join her on the scree ledge. 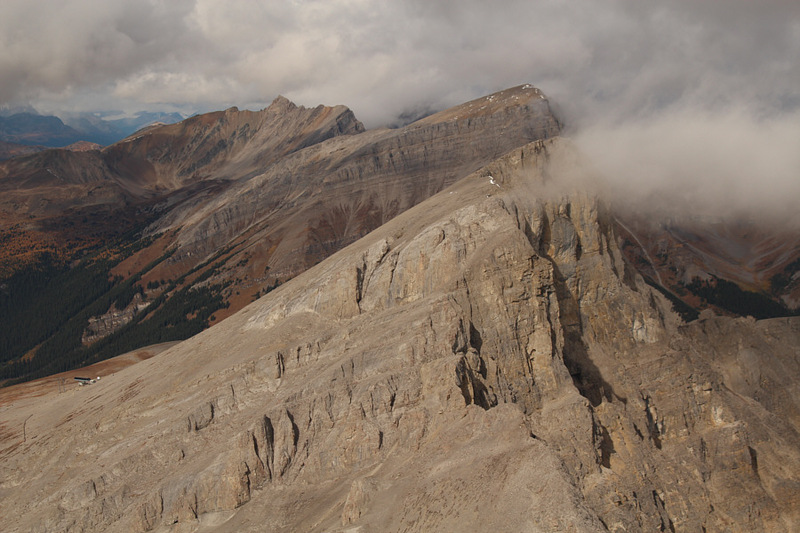 The peak in the background is the western outlier of Mount Howard Douglas. 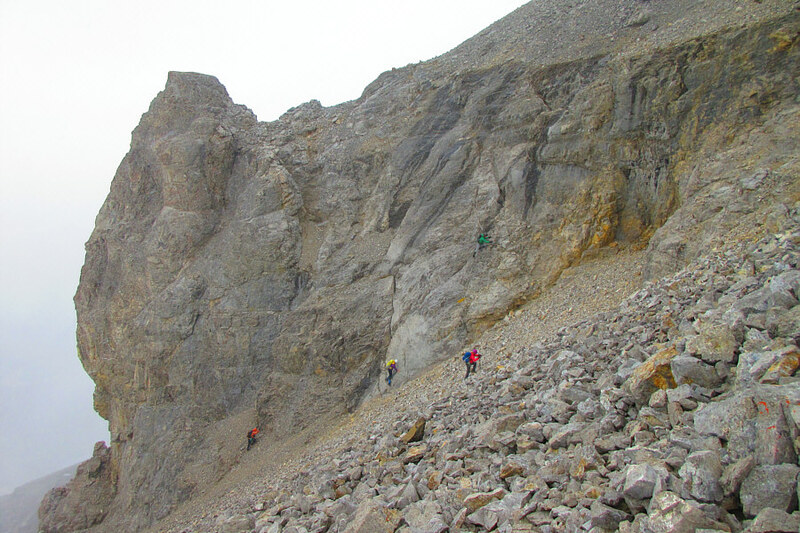 The group takes varying lines up the rubble slope just below the summit block (out of view at top right). 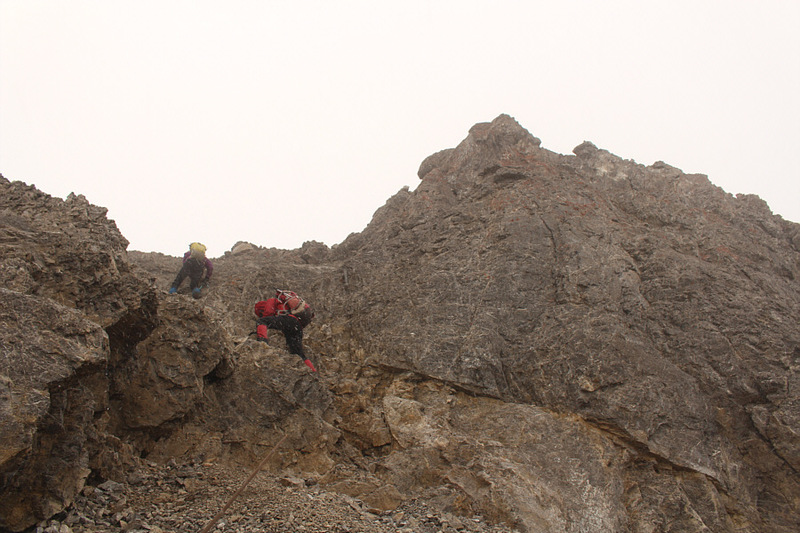 Zosia and Marta scramble up the south side of the summit block. Marta and Zosia clear the short rock step just below the summit. Numerous ski runs can be seen in this panoramic view from the summit. Here is another look at the western outlier of Mount Howard Douglas. To the south is Howard Douglas Creek valley. Sunshine Landing (GR882573) is the low-profile ridge just right of centre. Also visible to the right are Quartz Hill and Quartz Ridge. 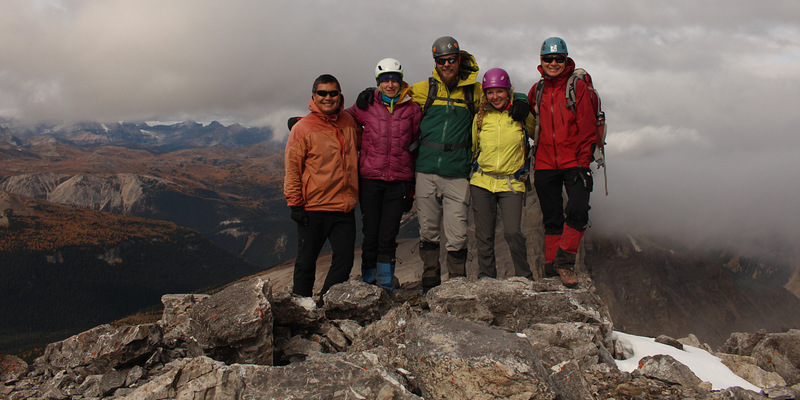 Sonny, Marta, Jim, Anna and Zosia stand on the summit of Mount Howard Douglas (2872 metres). 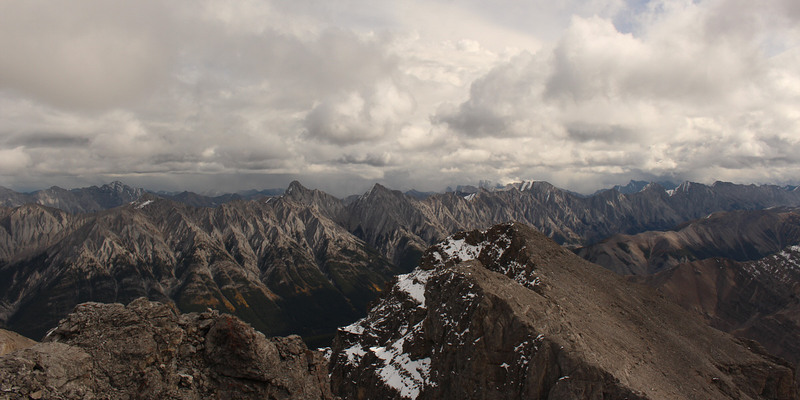 A sliver of Lake Minnewanka can barely be seen to the northeast. 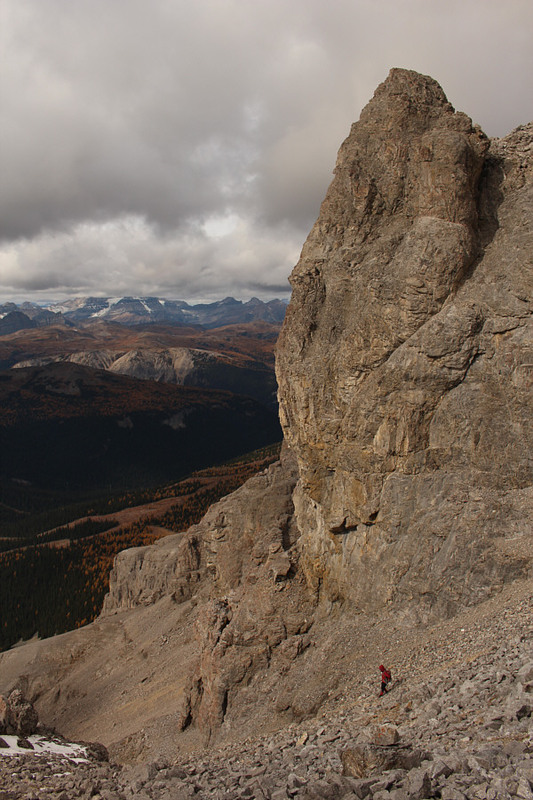 The Sundance Range stretches across most of the eastern horizon. Visible to the northwest are Black Brett, Mount Bourgeau and Eagle Mountain. Zosia carefully descends to the scree ledge which is just around the corner at bottom left. The group takes advantage of the loose rubble to quickly descend to the bottom of the basin. 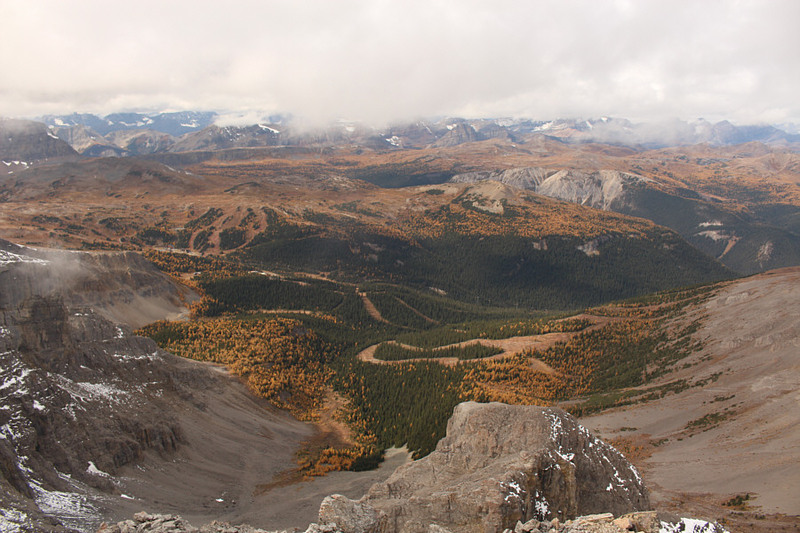 Here is a look back at the basin below Mount Howard Douglas. The group returns to the base of Goat's Eye chairlift with Mount Bourgeau in the background.